When I opened my eyes this morning Sam's face was just inches from face saying, excitedly, "Mom! There's a vulture eating a dead possum in the road!" Wow. Just what I like to hear first thing in the morning. Although Sam seemed pretty happy about it. Indeed there is a dead possum in the road in front of our house and it's providing breakfast for the many vultures that live around here. "Dead possum with vulture" makes an odd juxtaposition to my quiet suburban neighborhood. Usually the road kill ends up on the busier roads. I recently heard of some parents who wouldn't take their kids to the new nature movie, Earth, by Disney, because watching animals stalk and kill other animals was too upsetting even after Disney removed the blood and gore. Don't come to my house, then, because we've got the circle of life right here in the cul-de-sac. It was just the kind of thing that reminded me I have a place to take note of that kind of thing. So I came over here to say that I'm still alive. We went to Texas for Spring Break, which has become a nice tradition. The kids love it there. 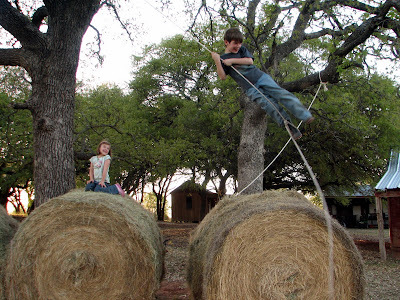 The ranch is always busy with pickup truck rides and shooting lessons, confetti egg fights and hay bales. And they get to do all these things with their cousins, which is why we now call it "Cousin's Camp." Click the photo below to go to the photo album. 'Disney's' The Earth is a rip off anyway. Planet Earth runs on tv all the time. Why should I pay Disney a gazillion bucks to see it in the theater? What a great way to spend Spring Break! Glad you all had fun. Hope the possum is gone soon? Glad to see you back to the bloggin'. I miss my updates! Especially my J & S photos.